Although every outdoor event is generally a happy and exciting affair, there are times when a little more privacy or protection from the weather is needed. You want to provide a cozier atmosphere in many cases, but you don't want to do without your favorite outdoor shelter. That's why, after finding their perfect outdoor shelter, many owners choose this White Sidewall Kit for Flaps for King Canopy 18 ft. x 27 ft. Canopies to accompany their canopy and to provide privacy, protection, and peace of mind to their gathering. 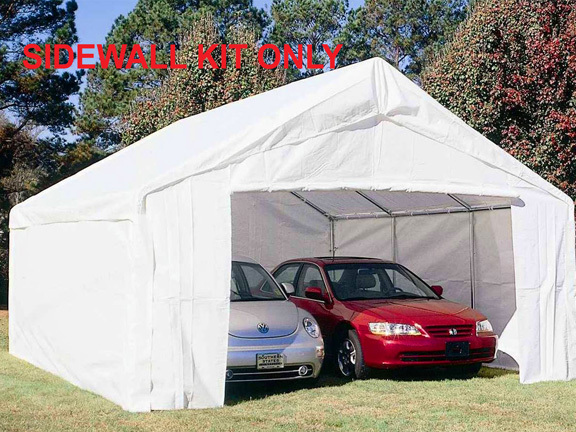 This kit consists of two 27 ft. white sidewalls that cover the canopy's sides and two zippered white endwalls that cover the ends. The zippered endwalls gives you easy entry and access, but can be zipped shut to keep the wind out or to provide maximum privacy. The endwalls have hook-and-loop fasteners that attach to flaps on the walls to nearly close all of the gaps around the corners at the canopy's legs. Even in an outdoor setting, a little privacy isn't always a bad thing. In fact, some situations absolutely demand it. Your dinner with friends, outdoor picnic, impromptu party, or other gathering may be a prime candidate for converting your canopy into a fully enclosed outdoor shelter. The White Sidewall Kit for Flaps for King Canopy 18 ft. x 27 ft. Canopies is convenient, it's simple, and it's affordable so that every shelter owner gets everything they need to make sure that all of their outdoor plans come off without a hitch.